If you are someone who is considering bankruptcy, you may have already spoken to or met with a bankruptcy attorney about your situation. Whether you had an initial consultation over the telephone or whether you appeared in the attorney’s office, you will recall that the bankruptcy attorney asked you a ton of personal questions. This is not because the attorney was being curious or nosy with regard to your personal situation. Rather, it was because the attorney was trying to determine whether or not you qualified for bankruptcy, which chapter of the bankruptcy code would be best suited to your particular situation and whether or not there were any issues that needed to be addressed or dealt with prior to an actual case filing. What Does The Questions Say About The Attorney? 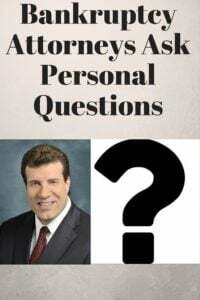 The type of questions that a bankruptcy attorney asks will tell a lot about the level of expertise and experience of that bankruptcy attorney. It’s more than just the amount of time that the attorney spends with you in an initial consultation. It’s the fact-finding and the probing which distinguishes one attorney from the other. Some things look perfectly well on the surface. Things may look great on a bankruptcy intake questionnaire filled out by the prospective client. However, it is the inquiry behind that information that often bears the most fruit. One such example would be the value and nature of real estate held by the debtor. The debtor’s interest in real estate property must be disclosed in schedule A of the bankruptcy petition. The information needed to complete that section is gathered from an intake questionnaire which the debtor completes. The debtor’s listing of the market value of the property, the approximate amount needed to pay off the debt, the amount of the monthly payment, whether or not that payment includes real estate taxes and insurance, whether the debtor wishes to maintain the property or surrender the property, how the title to the property is held and whether or not the debtor wishes to maintain or surrender the property. All of the answers to the questions above can play a significant role in whether or not the debtor will be able to maintain that property and protect it through Illinois exemption laws. As a bankruptcy attorney, it is not enough to simply rely on the debtor’s information without doing a further inquiry. The attorney must look at the date of purchase, the purchase price and then extrapolate that out to the current date. If the debtor purchased the property 10 years ago, then it is very likely that the market value has increased significantly. Most debtors are not aware of the actual market value of their property and the attorney needs to inquire further. Another example of the attorney continuing to ask probing questions relates to the statement of financial affairs section. This section deals with income, lawsuits, transfers of property, closed bank accounts, safe-deposit boxes, prior addresses, businesses owned by the debtor as well as other financial aspects of the debtor’s life during the past three or four years. This section is particularly important when it comes to the debtor’s transferring of property without significant consideration in close proximity filing for bankruptcy. The attorney must ask probing questions to determine whether or not the debtor transferred property, which could be a home or an auto or any other personal property, without receiving fair market value in return. Many debtors transfer property out of their name in contemplation of bankruptcy. This area is often looked on the statement of financial affairs and less the attorney does a thorough inquiry with regard thereto. Lastly, in particular regards to chapter 13, the bankruptcy attorney must inquire as to child support owed, tax debt owed, student loans owed as well as other general creditors. This is important because some debts such as child support must be paid in full for the plan where other debts such as old tax debt could be paid less than in full. Further, student loans, although nondischargeable can be paid less than in full through the chapter 13 plan with the knowledge that the unpaid portion will remain due and owing plus interest after the chapter 13 is completed. The attorney is going to inquire with particularity regarding these debts so that a proper chapter 13 plan can be created. In summary, a bankruptcy attorney must ask an incredible amount of probing, personal questions in order to properly prepare a case and to properly advise a client. You should expect that your attorney is going to do a thorough examination of all of your assets, liabilities, income and expenses. This is all being done for your benefit. The attorney wants to make certain that you are filing the right chapter, that your property is going to be protectable to the maximum extent permitted by Illinois law and that you are not going to be blindsided by either the chapter 7 panel trustee or the chapter 13 trustee. In fact, the more personal questions that your bankruptcy attorney asks of you, the better you will be served.